Pumpkin Muffin Recipe with Spiced Cream Cheese Frosting - THE OLIVE BLOGGER - Recipes your family will love! Nothing says Fall like the scrumptious scent of Pumpkin Muffins wafting from the kitchen while the sun bursts through your open windows allowing a crisp breeze to take you away to another place…ahh how I love this season! I couldn’t think of a better thing to do with my day off this week than do what I love the most…BAKE! 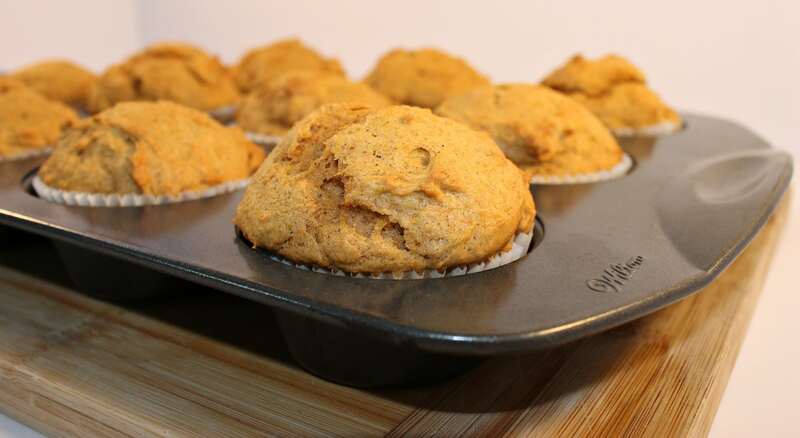 Which is why I am sharing with you guys my delicious and easy Pumpkin Muffin Recipe! I seriously love this recipe! And, like most of my recipes, it is versatile!! You can add chopped nuts, candied pumpkin seeds, cranberries…you name it! Just think of how lovely these would be after a giant Thanksgiving dinner!! I mean…if you want to share them you can bring them along, or just keep them un-iced in a sealed container to enjoy over the course of the week (you know when you are ripping your hair out from all that stress that comes with planning and executing a holiday meal)! But not to worry, over the next week or two I will be getting you guys ready for Thanksgiving with everything from your main meal to side dishes and of course yummy desserts! A delicious and easy Pumpkin Muffin Recipe with a flavorful Spiced Cream Cheese Frosting - a PERFECT treat with the cooler days ahead! 1 C Pumpkin Puree NOT spiced pie filling! In stand mixer cream together margarine with sugars until light and fluffy. Add in pumpkin puree, eggs and vanilla and beat on medium-high until mixed together. In the meantime, cream together butter and cream cheese with powdered sugar until a creamy paste forms. Add in milk and beat until thick and creamy. Beat in the vanilla and spices and mix well until fully combined. Once the muffins have cooled completely you can ice and enjoy (or place in a sealed container for up to one week and ice when ready to eat!). Tips and Tricks for the perfect pumpkin muffin every time! Allow your muffins to cool COMPLETELY before icing them, otherwise the icing will just melt off. You can freeze these (and most muffins) in a tightly sealed container so you can ice and enjoy them later! No need to wait until the day before a holiday to make all the components of your meal! Make what you can ahead and enjoy a glass of wine instead! Well, there you have it! Another delicious and easy dessert you can enjoy any day of the week! If you are like me and loooove Fall flavors then you better get started on this easy Pumpkin Muffin recipe…I can’t wait to hear what you think of them! looking for more recipes like our pumpkin muffin? This post contains affiliate links, they cost you nothing more but allow you to see the tools I love to use in my own kitchen! Please see my Disclosure page. Ooooh my goodness, these look amazing! I love everything pumpkin. Pinning to try later! 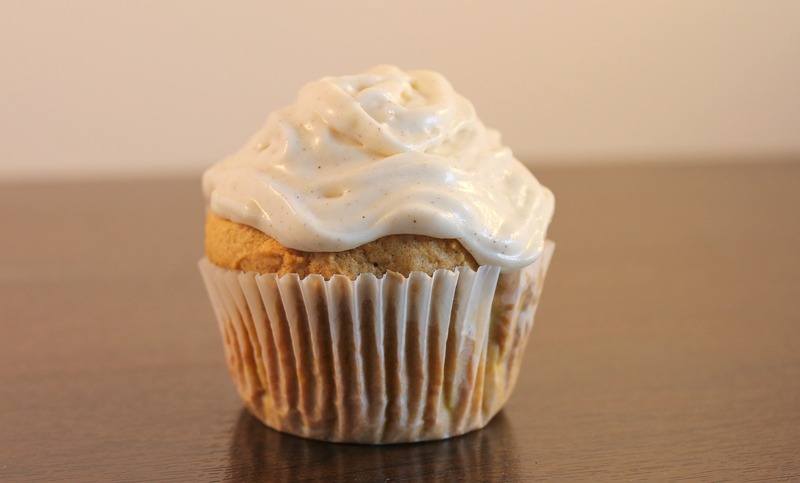 pumpkin + cream cheese frosting….yes please!!! I love pumpkin and spice, the aroma is just so comforting and warm. Thanks for the tips too! This looks amazing…I can’t wait to try them! You just keep fueling the pumpkin obsession, Melissa! These look incredible! I love fall flavors too. Can’t wait to see what else you have for us! Thanks so much Melanie!! It is hard not to fall into the Pumpkin Spice trap at this time of year, it is just too yummy!!! These look so so yummy. I love how you can put anything in them and they’ll still be delicious! And here’s to that glass of wine and making things ahead of time! So true Cristina, always nice to have a versatile recipe ( I can’t do things that aren’t flexible!) and we always have to leave a little time for wine am I right?! Yay for fall! These look so great! I love your tip about using a cookie scoop to get evenly-sized muffins. Such valuable information! Thanks for sharing!! Thanks <3 I love to share my tips, anything to make baking easier and of course more FUN!! !